Author Harper Lee will have a second novel published in July 2015, her first since To Kill a Mockingbird in 1960. Click the link for a brief bio and a link to her natal chart. Born on April 28, 1926 in Monroeville, Alabama (5:25 pm CST according to her quoted BC/BR, an ‘AA” Rodden Rating), Ms. Lee has a Sun Taurus-Moon Scorpio/Earth-Water personality blend of practicality, domesticity, and innate wisdom–a creative introvert who has for the most part lived her life out of the limelight for decades. Perhaps this blend’s independent spirit partially accounts for it even though an intense dramatic talent is there as well. A highly perceptive Sun Taurus-Moon Scorpio personality possesses ‘staying power’ as we find from ‘Mockingbird’ retaining much popular appeal through the decades, and both material and emotional comfort are desired. Lee’s personal magnetism and self-confidence have helped make her and her work very attractive to others yet she may have been called ‘bossy’ once or twice in her life! Difficult to live with? Perhaps, but authors do need to stick to their ambitions if their books are to be accepted by publishers, and generous servings of Scorpio obsession and firmly held convictions help to complete the difficult task as well. Even her natal Mercury in Aries, planet of writers, being posited in a different sign from her Taurus Sun gives her an ability to see things from the perspective of others, a valuable ability for any author who wishes to ‘inhabit the skin’ of her characters. Plus, Mercury is in her 6th house of Work, Service, Daily Tasks, and Health so her thinking has been easily directed into these life departments. Okay, now let’s consider a few of July’s transiting planets contacting Harper Lee’s natal chart. Other astrological factors are in play, of course, such as Progressions, Solar Returns, and Returns but this is meant as a simple overview on such a singularly stellar occasion! And since I don’t yet know an exact publication date for her ‘new’ novel (written prior to ‘Mockingbird’), I shall use the Full Moon horoscope of July 1, 2015 @9Cap55 as a symbolic stand-in for the entire month of July. Plus, Full Moons typically relate to any endeavor dependent upon publicity and fortunate public reaction so if her publisher is astrologically in tune, the book will appear a few hours prior to a Full Moon for maximum impact. However, July 2015 (reportedly the month for publishing) contains two Full Moons: one on July 1 (9:19:33 pm CDT Monroeville, AL) and one on July 31 in Aquarius. Natal 9th h: 2015 Sun @9Can55 approaches natal Pluto 12:47 (a formidable time when use of power is highlighted) conj NN (public contact) and Sirius; 2015 Mars @5Can03 soon conjs n Pluto (finding a new use for old things, rejuvenation, karmic links); the n Pluto-NN conj (the ‘tiger by the tail’ combo) shows where n Fixed Stars are being powerfully activated; 2015 Pluto @14Cap22 Rx oppo n Pluto, an ‘advanced age’ period of societal power struggles that have little or no affect on one’s personal life but I mention because of Pluto’s connection to publishing, promotion, and life-death issues such as found in To ‘Kill’ a Mockingbird). Natal 10th h of Career and Public Status: 2015 Jupiter @21Leo46 conj n Neptune @21Leo59 Rx describes a time of inspired ideas, enhanced creativity, promotion campaigns, illusion, and perhaps less contact with reality than previously–or, more need for an elusive lifestyle. ‘Grand plans’ and good fortune are obviously on the table now; spiritual development may also be indicated; generous Jupiter–also associated with publishing–passes its shadow Rx degree around July 7 or 8, about one week before the New Moon of July 15 @23Cancer which falls between her n Pluto-NN and n MC…a new start; 2015 Venus conj n Neptune in dramatic, showy Leo, denoting profitable results from creative endeavors and flattering photographs, if any are taken. Natal 1st h: 2015 Full Moon MC (Goals; Aspirations) conj n Moon @19Sco33 supports the public contact and publicity already indicated along with spiritual unions as the public meets Harper Lee’s next published novel; the nearness of n Saturn @23Sco54 Rx shows her past work brought forth to be revealed upon the world stage (2015 MC @19Sco49 which is also conjoined by her Progressed Saturn @19Sco25!) 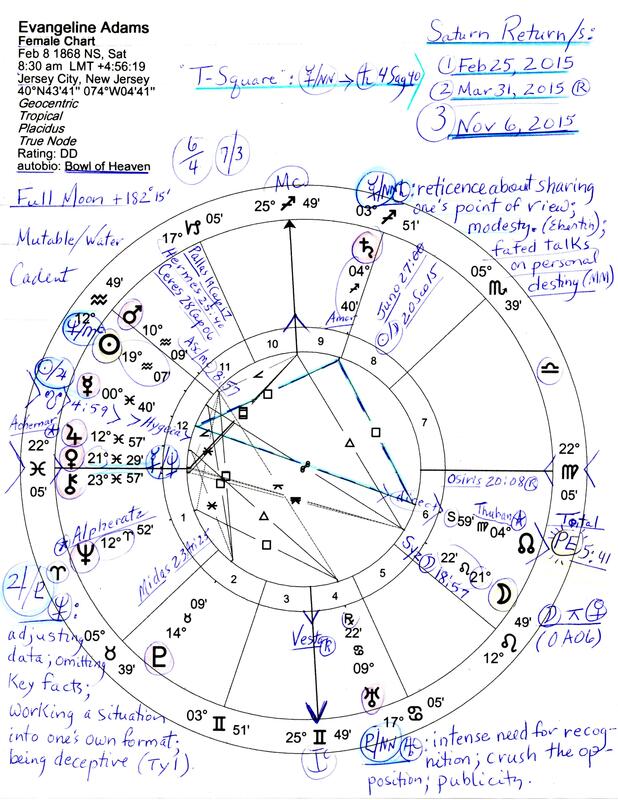 and the work is of an intense nature (Scorpio); n Venus @21Pis57 in 5th h of Creative Pursuits and her chart-ruler (n ASC 25Lib47) is now catalyzed by 2015 Chiron Rx @21Pis31 hinting that this is a time when Harper Lee’s creative self-expression is once again given an outlet that will may well bring wholeness and healing within relationships and provide her with a sense of fusion with the Universe. Yes, there are several other chart factors of note (exs: the March 20, 2015 Solar Eclipse conj Aries Point of world fame, rewards, recognition–near her n Uranus in creative Pisces 27:44), her recent October 2014 Saturn Return, etc) yet I’m confident you shall discover and appreciate them! But for now, let’s end with a few famous words from the lady herself given in reply to the question, why had she never written another book? Well, decades have passed since 1960 and times have changed, and my suspicion based on the July 2015 transits listed above, her enduring popularity, and other factors, is that Harper Lee’s newly published book–written years ago–will not have the problem of going ‘down’. Here is a horoscope of The Death of Wolfgang Amadeus Mozart on December 5, 1791 at 1:00 am in Vienna, Austria which occurred during an Hour of Saturn, karmic planet of endings, restriction, and loss. Chart-ruler Mercury @19Sag09 is approached by the Sun @12Sag52 and both embrace Mozart’s very close natal Moon-Pluto conjunction (17Sag45/47) in his natal 4th house of Endings and The Drain. In life, a Moon-Pluto conjunction shows deep passions and emotions, idealism, a domestic tyrant, and a bottomless fount of creativity. The critical 29th-degree Death (Ascendant) when rounded up is apt: ’30 Virgo’ = “Having an Urgent Task to Complete, a Man Doesn’t Look to Any Distractions” (Solar Fire Astrology Software). Sun (vitality) and Mercury (his natal chart-ruler), a 7th house Moon-Saturn conjunction in Mars-ruled Aries (plus, South Node of the Moon @10Ari58 stationary suggests major separation from the lunar physical body), and an 11th house Uranus @18Leo56 Rx form a Fire Grand Trine indicating that his health was greatly affected by an overindulgent lifestyle, personal excesses, lack of rest, and workaholism which perhaps is to be expected from one gifted with musical genius and an unfortunate tendency to overspend all earnings as well as to waste vital resources (health). If you enlarge the chart image you’ll find several more details scribbled thereupon including physical indicators for various planets and planetary blends as given by Reinhold Ebertin (The Combination of Stellar Influences). Moon-Saturn = bladder infection (which may have been an inherited tendency–he had suffered from it in the past), Venus at a critical, anxious 29th degree (as is the Ascendant, the death itself) with Venus denoting bladder and veins along with Venus-Neptune (sexual disease; weakened bladder/kidneys); lead planet in a Locomotive pattern is Uranus (pituitary gland); Mars @17Vir48, sign of the bowels = infection and/or assault, Mars inconjunct Pluto = depleted energy from taking on too much work than can safely be done (“so much to do, so little time”), financial stress, poor nutrition, and self-persecution from a feeling of guilt that he had to work more than others in order to prove himself. Creepy Pluto @20AQ01 conjoins Mozart’s natal Vertex, a fated point of encounter often involved or triggered at times of death, plus, mythological Pluto is the ‘god of Hades’ and astrologically rules the Scorpionic 8th house of Death and Transformation. In the chart, the Saturn-Pluto midpoint (calcification) @16Pis04 in the 6th house of Health is opposed by 12th house Mars which denotes a fight for one’s existence; the midpoints of Moon-Mars (thyroid gland) and Mars-Saturn (bone marrow inflammation; organ atrophy; death) at Midheaven along with Mozart’s natal Mars @00Can19 (00Cancer, a Cardinal World Point of Fame and Prominence) are very descriptive and Mars (or Saturn, Uranus, Neptune, Pluto–sometimes Jupiter and often the Moon as a timer) is typically Angular in cases of death. Even transit Mars in Virgo had recently conjoined his natal Ascendant (physical body) possibly aggravating chronic health conditions and/or bringing infection (see Fire Grand Trine, above). Mozart’s death (just shy of his 36th birthday which points toward Jupiter, planet of liver and gall) occurred under the rays of a rising 10 North Solar Eclipse @4Lib45 and is the Pre-Natal Eclipse of his death. Curiously, 10N is also his natal Pre-Natal Eclipse (13Vir19) which conjoins natal Ascendant (12Vir41) along with his natal North Node (NN) @11Vir27 rising (born January 27, 1756 8:00 pm Salzburg, Austria; Hour of Mars, chart-ruler Mercury @8AQ08 opposes undermining Neptune Rx in Leo across the 5/11 axis of Creative Pursuits and Self-Will). Creating stress, natal Uranus @13Pis11 conjoins natal South Node (SN, a Saturnian point of separation) and opposes and thus triggers his Pre-Natal Solar Eclipse in the 10N Saros Series which contains themes of: communication, feeling tired and drained, frustrating or inhibiting events by way of paperwork, news, or a young person; taking it easy and working through things one at a time (Brady’s Predictive Astrology). As you know, Mozart did not take it easy and was furiously working on a Requiem Mass (‘paperwork’) for “a mysterious stranger” — with the foreboding presentiment that the mass was for his own death, as the legend goes. Perhaps the recent opposition from transit Mars in Virgo to Mozart’s natal Uranus can be noted since it can indicate a dangerous encounter with a stranger! Though Grand Trines are usually considered beneficial they may also bestow a childish view of the world and a sense of being able to do whatever one wants whenever one wants. Overindulgence may come under this category and if you’re familiar with the life of Freemason Mozart you know how closely this description tallies with his lifestyle and attitude and some may believe that it was only his God-given talent for composing, playing, and conducting music that lifted him up to the heights of creative heaven from which he reigns today. Although causes such as poisoned pork chops and Freemasonic involvement due to his revealing certain Masonic mysteries in his opera The Magic Flute have been theorized through the years, it would seem that Mozart’s death horoscope points toward chronic medical conditions, taking very poor care of himself, overwork to the point of complete exhaustion, infection, and possibly an inherited health condition or organic weakness, along with extreme anxiety over financial lack and the completing of an important task as complicit culprits in his demise. These conditions might certainly be described in our modern terms as the gathering of a ‘perfect storm’ of unfortunate circumstances and draining events for this musical genius who too-quickly burned himself out. Born in Brooklyn, New York on June 8, 1933 (2:00 AM), Ms. Rivers had the communication and fast-thinking skills of a Sun Gemini opposing Moon in Jupiter-ruled Sagittarius, sign of actors and comedians. Not that Geminis can’t be funny, too! Her just-past Full Moon birth indicates that relationships and hyper-awareness were very basic themes in her life. As you see from the year 1933, Joan Rivers was born during the war torn Mars-Jupiter-Neptune conjunction in Virgo (sign of The Critic and she was that both onstage and on the Red Carpet, pioneering the “who are you wearing?” schtick.) These planets are the ‘Marseillaise Trio’ with its take-no-prisoners energies. For Joan the Trio appears in the 6th house of Dedicated Work and with her chart-ruler Mars (planet of impulse, energy, and action–Ascendant 3Ari53) Joan is famous for her decades of hard work in Comedy and her highly energized, even manic, performances. Another factor indicating her high energy level and long career is a trine between natal Sun (ego, pride, physical constitution) and authoritative Saturn (work, concentration) showing longevity of life (June 8, 1933–September 4, 2014, age 81) and her decades-long career. Plus, natal Midheaven (Goal/Career/Public Status) is in Saturn-ruled Capricorn. Her daughter Melissa (b. January 20, 1968 in NY) has said that her mother in private wasn’t funny with people she didn’t know–such as at dinner parties. She was “shy and nervous” and of course anyone who’s familiar with the Mercury-ruled sign of Gemini knows how very nervous they can be. In addition, Joan’s Mercury and Venus are conjoined @29Gem, a critical or crisis degree. Mercury-Venus gives writing talent and pleasant contacts with the public. Perhaps some of the hectic or manic energy Joan Rivers often displayed along with the ‘quick comeback’ ability of Gemini may be found within the critical 29th degree that is doubly emphasized in her natal horoscope. After all, a 29th degree may be said to be impatient to reach the next sign which for Joan is Moon-ruled Cancer–in fact, 00Can00, a World Point of Prominence, Fame, and Success–and the Moon rules such realms as publicity and the public. 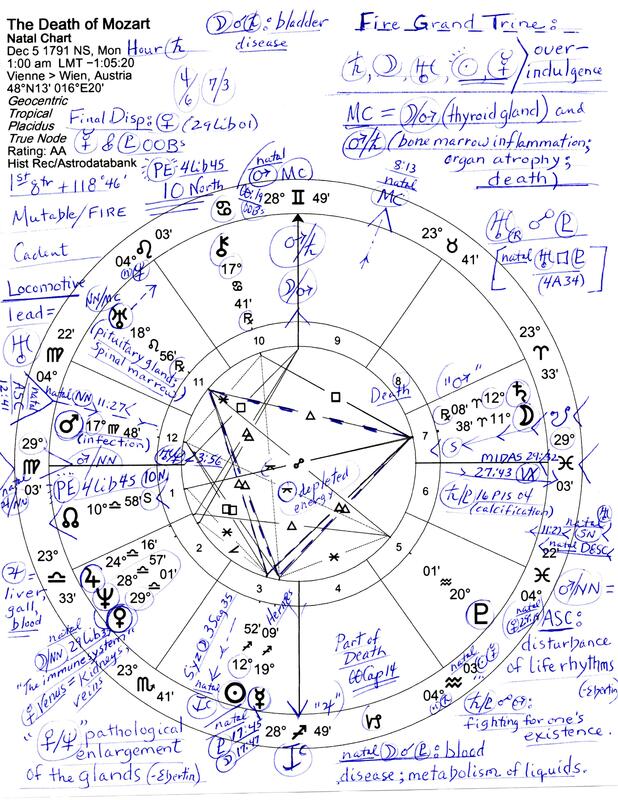 Now this is merely a brief astro-portrait of Joan Rivers and you may of course find much more information hidden in her natal chart so feel free to leave your insights with this post. Disagree if you must, add more info if it suits! To close, I add that to me, one of the best things to say about anyone who has passed away is, she will be missed. May the brilliant Joan Rivers R.I.P. Who does JFK’s grandson Jack Schlossberg favor? It is my considered opinion that John F. Kennedy’s only grandson, John (Jack) Schlossberg, son of Caroline (our new ambassador to Japan), favors his Uncle John Jr more than he favors his grandfather Jack Kennedy. Jack, age 20 and studying emergency medical technology at Yale University, is being haled as a handsome lad and with this who could disagree? Recently he spoke at the 50th anniversary of New York’s John F. Kennedy Airport, and was on hand for the photo shoot of his mother being sworn in as ambassador to Japan. Some folk are calling him a “budding statesman” though unfortunately he may want to be careful to not become too popular with the public if he enters Politics, if you know what I mean. Here’s a Tumblr page http://kennedylegacy.tumblr.com/post/3815450742/jfks-only-grandson with more info and some early photos, if you’re interested. Capricorn is, as you know, the sign of government, law, and business and is ruled by conservative Saturn while Aquarius is ruled and co-ruled by both Saturn and Uranus. With his natal Venus exalted in compassionate Pisces, support for Aquarian humanitarianism may be found with Sun in Aquarius, sign of the Water Bearer (his birth hour is unknown.) Plus, natal Pluto in Scorpio, sign of regeneration and medical procedures, supports his interest in medical studies. January 19, 1993 falls into the 13 North Saros Series of Solar Eclipses and the initial Solar Eclipse of 13N manifested on August 14, 1776 @22Leo. As you also know, the rest of the signatures on the Declaration of Independence were penned on August 2, 1776 which is in range of the 13N eclipse (2 weeks prior or after) and syncs the beginning of a new nation with the start of a new eclipse Series. Einstein quote on Astrology a hoax! Well, this explains a lot. I have always wondered if Albert Einstein thought Astrology was so useful why didn’t his opinions and use of it surface with more substance than a wispy quote or two? Turns out that one of Einstein’s more cited quotes concerning the ancient system of analysis is a hoax and is actually from someone else. Sun Pis-Moon Sag has a double Jupiterian influence and denotes a philosopher-mystic who is friendly, generous, and possesses a far-seeing imagination. And yes, he was religious yet avoided religion of the organized variety. Humility mixes with nobility here and there is an endearing childlike quality (which made women want to console and cuddle him) yet a strong need for contemplative withdrawal is obviously felt. A sense of humor is notable (‘jolly’ Jupiter!) as is a restless discontent, a sense of grandiosity (he knew he was bound for glory as he toiled in the patent office), and a struggle to resolve tensions between his beliefs and political ideologies was a destiny that could not be avoided. Another word of advice: question the validity of all you read on the Internet including this post! For more info see: Sun Sign-Moon Sign by Charles & Suzi Harvey.